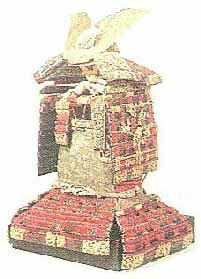 Munemichi Myochin who has maintained traditions as Kajiya of armors as 52nd head of family has a great dream. His dream is what he can reproduce armors. He is sure to reproduce of metal parts. But kinds of string and leathers are also needed to construct armors. He think he want to realize of his dream with friends who has maintained traditions as "the Sanada strings" and Called "Kousyu-Inden", japanned leather, even though it will take few years. Techniques in old age had been created by try and error, and experiences. 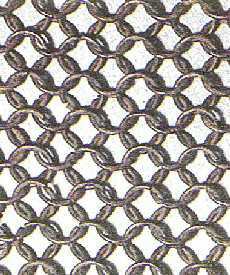 For instance, Many kinds of coloring method on iron had been developed. One of black coloring is what man wipes surface of heated base metal by silk cloth and another is what man lacquers on surface of base material and so on. This Kusari-Katabira (Hemp gown made with chains) are made into nets with wires which have up to 1 mm diameter, are bent to circle shape and are tacked at 2 points of circle.